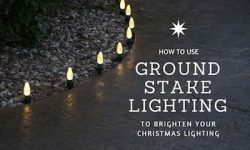 Mounting strings of lights along driveways, sidewalks, patios and pathways, for example, adds a brilliant touch to any outdoor decorating project. But getting each of those lights to stay where you want, safe and secure, and not lying directly on the ground - that's one of the above referenced headaches. 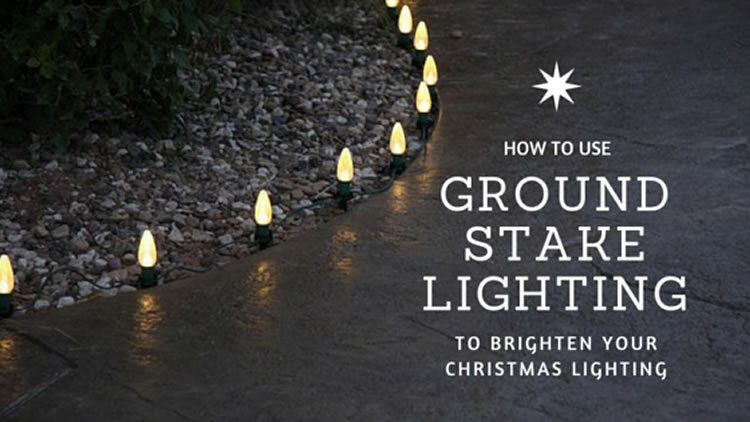 Light stakes make quick, easy, and precise work of installing ground-bound holiday lighting. And our light stakes are designed to be completely unobtrusive. 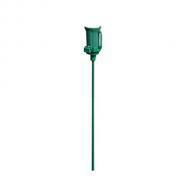 The bulb attaches to the top of the stake, so nothing impedes the view of the bulb from any direction. All-In-One Light Stake. 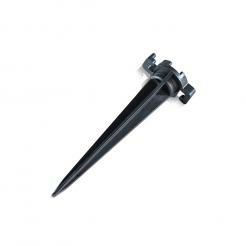 These are the least expensive of our stakes, and will work perfectly well for many applications. They're very easy to use: you simply bend the top tab (the clip portion) of the stake down 90 degrees until it locks into place, and then slide the base of the bulb onto the clip. If you're using stringer light sets (the kind where the bulb is not replaceable), this is the only style of stake that will work. Be aware that if you live in a particularly cold climate, the All-In-One stakes might not be your best bet. The bendable top tab is prone to breaking in freezing temperatures. All-In-One stakes come in two lengths: 7.5" and 15", and will hold mini lights, C7 lights and C9 lights. Universal Light Stake. This is our most popular stake, and for good reason. It's very durable, and very easy to use. It's made of high-grade plastic, and there are no movable parts. So it will handle any temperature extreme, and last for a very long time. Unlike the All-In-One stake, the Universal stake holds the bulb in place by passing the cord through two side-mounted tabs, with the base of the bulb cradled securely upon the platform on top of the stake. The two tabs that secure the cord face in opposing directions, making an accidental dislodging of the bulb extremely unlikely. Universal stakes are 4.6" in length, and will hold C7 lights and C9 lights. Works only with lights on which the cord enters and exits the base of the socket (see photo). Universal Metal Light Stake. 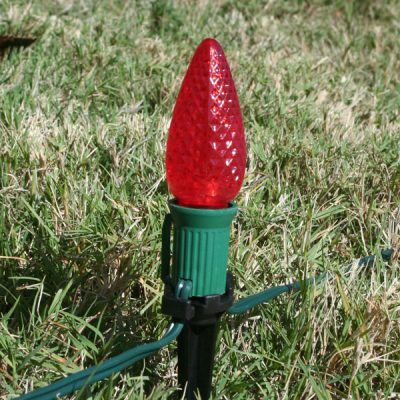 This is our most durable light stake. It's the most durable stake on the market, in fact, and is the best choice for commercial applications.Universal metal stakes use the same cord-securing tab design as the Universal plastic stakes, but with the added durability of the plastic head mounted on a solid metal stake. The metal stake will last indefinitely, and the plastic head can be replaced if needed. 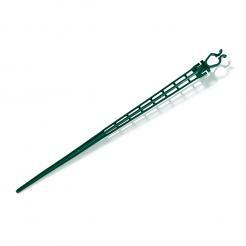 Universal stakes are 15" in length, and will hold C7 lights and C9 lights. Works only with lights on which the cord enters and exits the base of the socket. Then you've been doing the job the hard way! Using light stakes will make your life a bit easier, and eliminate one of those pesky problems that can diminish the delight of a mostly-fun job. For the best results, plan for a spacing of about 12" to 15" inches between your ground lights. And if the ground happens to be frozen at installation time, planting the stakes will be easier and faster if you'll pour some hot water on the ground at each planned stake location.